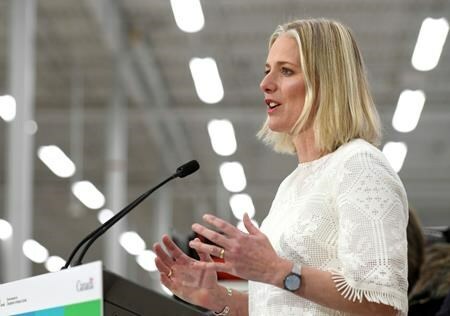 OTTAWA — Canada’s greenhouse gas emissions edged up for the first time in three years in 2017, pushing the country even further away from its international climate change commitments. 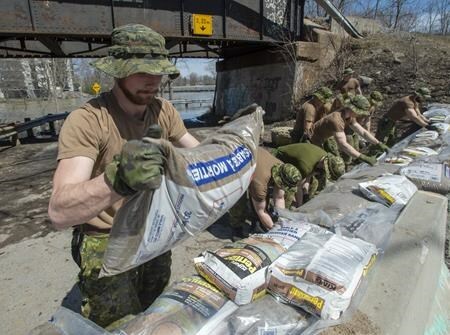 MONTREAL — More than 600 Canadian soldiers have fanned out across Quebec, filling and stacking sandbags as officials warn that flood waters are likely to keep rising this week due to warming temperatures that contribute to snowmelt and ice movement. Urgence Quebec said yesterday that five major floods were threatening thousands of Quebecers, that 1,280 residences across the province had been flooded and that more than 1,500 people had left their homes. As he toured a flood zone in the Laval area Sunday Premier Francois Legault noted that many home owners were still repairing damage caused by record flooding in 2017. He also suggested that Quebecers whose homes are repeatedly flooded may eventually be forced to move. Meanwhile, about 120 Canadian soldiers have been deployed across western New Brunswick where 15 communities remain on flood alert. 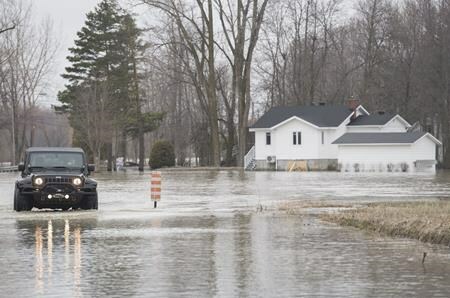 Rising water has forced the closure of at least 35 roads in the province and Premier Blaine Higgs has urged residents to do what they can to protect their families and property. Officials said flooding is expected this week in an area between Fredericton and Saint John as the Saint John River breaches its banks. Residents have been warned to stay away from the river because the water is very cold, the current is strong and there is plenty of debris scattered among the ice chunks. MONTREAL — Quebec Premier Francois Legault is visiting flood-damaged regions north of Montreal today, as warm temperatures and rising water levels threaten to worsen the spring flooding already wreaking havoc across a wide region. Legault was set to visit a community centre and flooded homes on an island in the Laval region, where Canadian Forces troops are expected to join the efforts to limit the damage. The city says it could receive another 20 to 40 millimetres of rain in the coming days. On Ile Bigras, off the southeast edge of Laval, about two dozen soldiers unloaded a truck full of sandbags on Sunday as they worked to reinforce a concrete barrier only metres from the rushing river. Public affairs officer Pierre Leblanc said the army’s priority would be filling and stacking sandbags and protecting critical infrastructure near the river, which he said was rising about one centimetre each hour. He said some 600 soldiers had been deployed across the province, including about 200 in the Laval area. Near the entrance to the island, several roads were closed due to flooding and one home appeared partially surrounded by water, as small waves lapped at a picnic bench and a “For Sale” sign on the lawn.